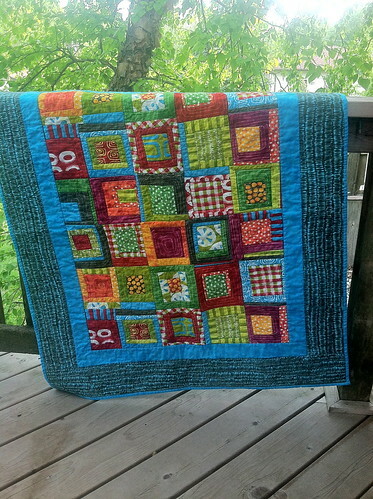 I used "A Stitch in Color" fabric by Malka Dubrawsky. That center piece, that looks pieced, is in fact, yardage. It went together like a dream. 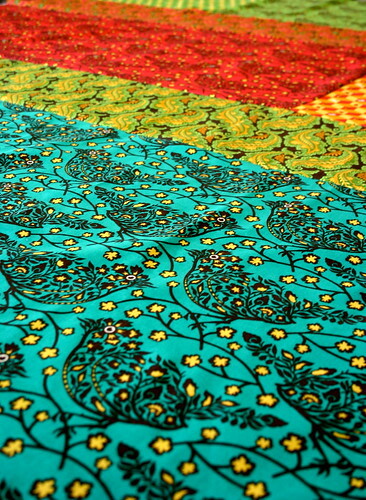 It was fun to see fabric in my machine again. Been a long time, to say the least! 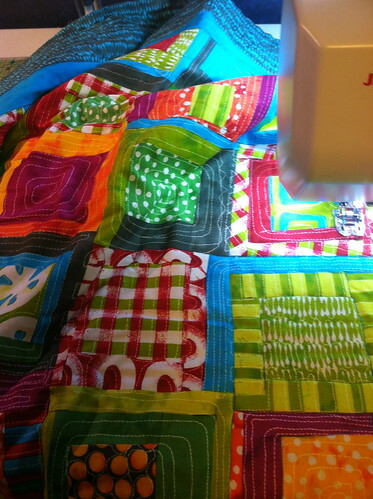 Had trouble with the free motion quilting, so I went back to the walking foot. I love the fact that there is green outside again! It makes anything look great. Isn't spring wonderful?! 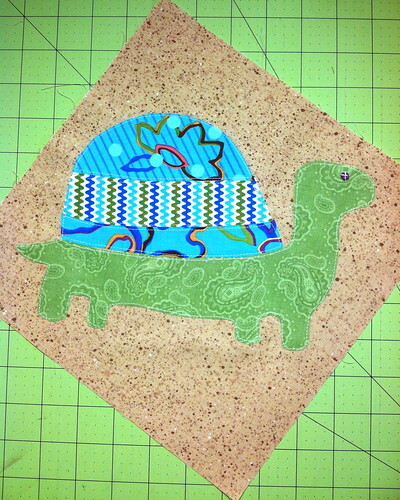 Cindy, in the BUBK Bee, sent sand fabric and asked for beach/sea themed blocks. 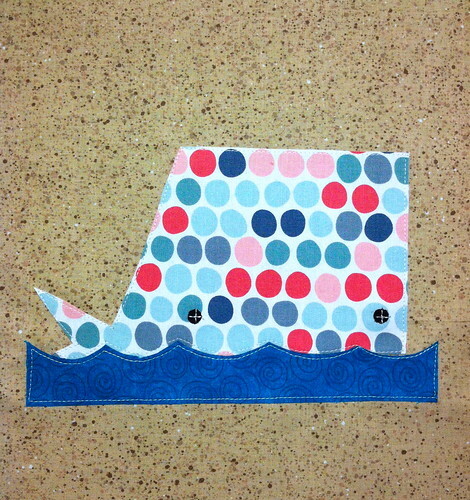 I love this boxy whale. I think she is a female and her name is "Dot". This guy is just fun. He is either climbing a hill...or going down the other side. They move so slow it is hard to tell. 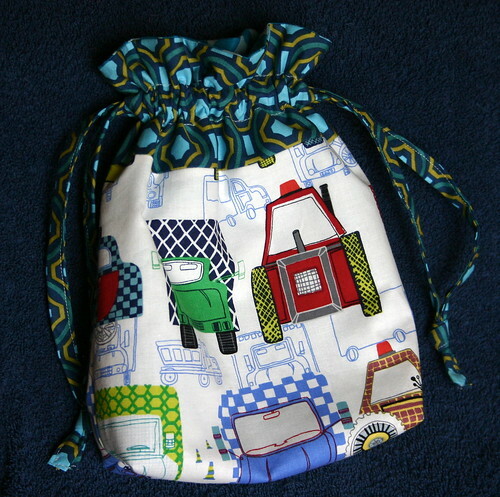 Drawstring Bag for a Sweet Boy, a photo by myfullcolorlife - Vickie on Flickr. My sister found this adorable drawstring bag pattern online and we decided it would be the perfect bag for the little ones to take toys and snacks to church. Fabrics are leftover from this and this. 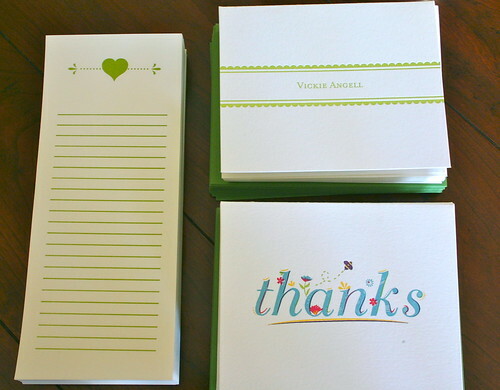 Letterpress Christmas gift, a photo by myfullcolorlife - Vickie on Flickr. 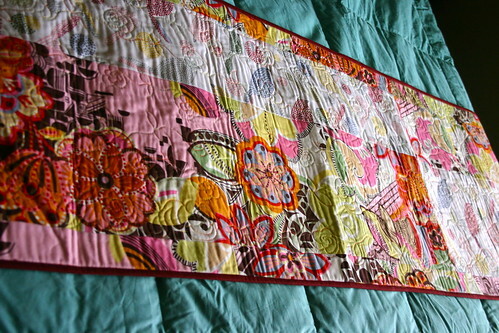 This darling bed runner was my Christmas gift from one of my sisters. She made us all bed runners for the foot of our beds. 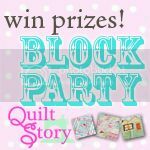 This is such a great idea, because then, with a little bit of effort, you can practice all kinds of techniques and fabric combos, even free motion quilting, and have a different look for your bed. I love it! There she is...all nestled in a lovely quilt sandwich. I love the colors in this line. They are deep and rich, a nice contrast to February. 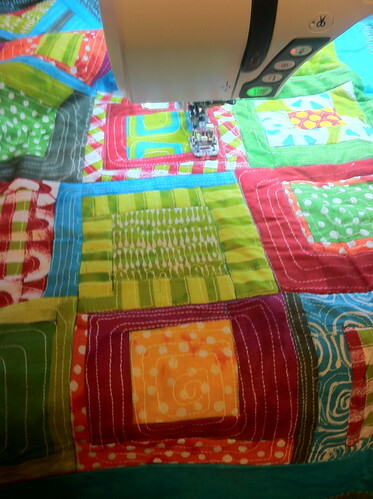 :) I think the quilting will have to wait. 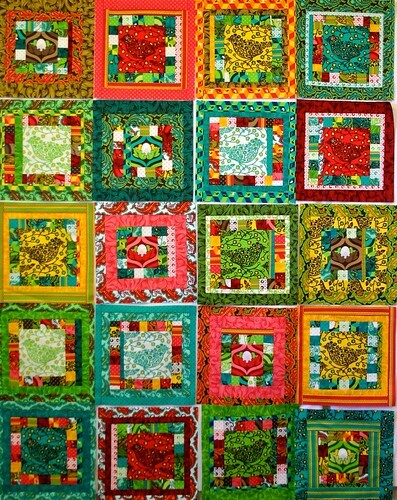 I have a bunch of practice mini quilts that I want to do first. 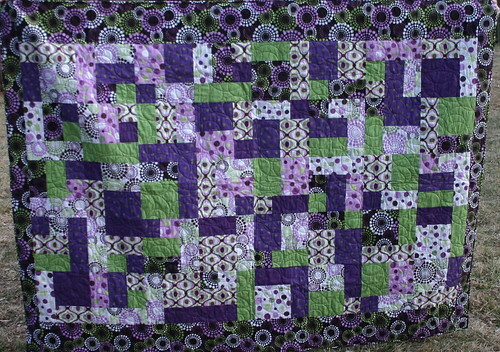 This quilt is too special to rush. 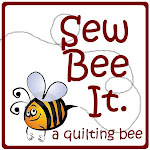 Right now I am leaning toward a simple straight line pattern and mixing in some hand quilting with pearl cotton in a variety of colors outlining the bird or the nest. 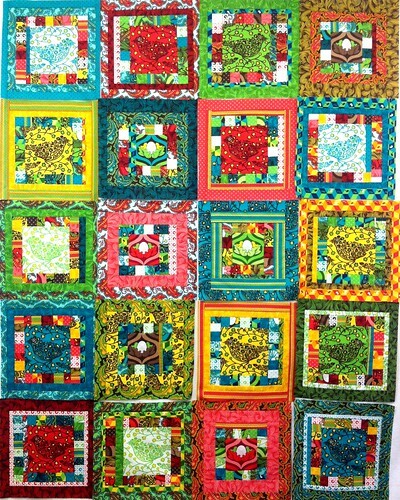 I also considered a circular quilting pattern, and think it would be fabulous, but I really want to do the hand quilting. Not sure how they would look together. What do you think? This is my final placement of the blocks. 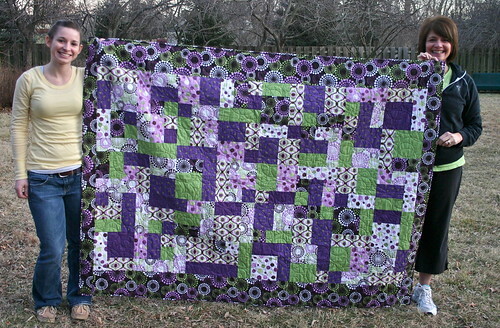 And this baby is all together with a backing in a quilt sandwich waiting for me to decide how to quilt it. Once I work through the photos, I will post those pics. Love how it turned out!!!! 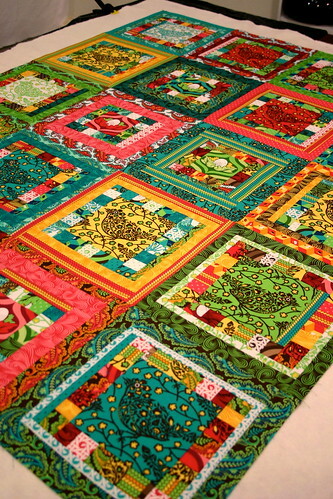 Any suggestions for quilting??? First: Kansas in January = Dreary pictures. Just saying'. 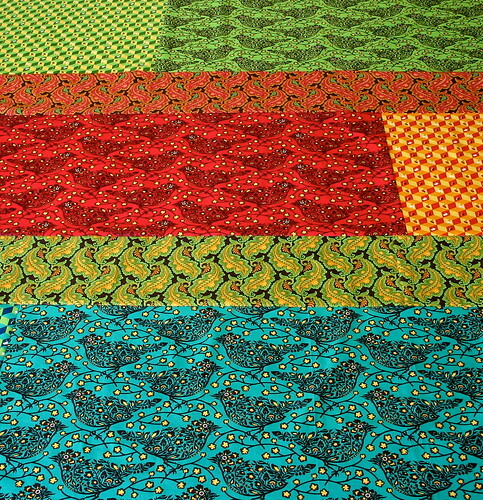 Janice got this fabric for Christmas last year and she finished the binding last weekend. 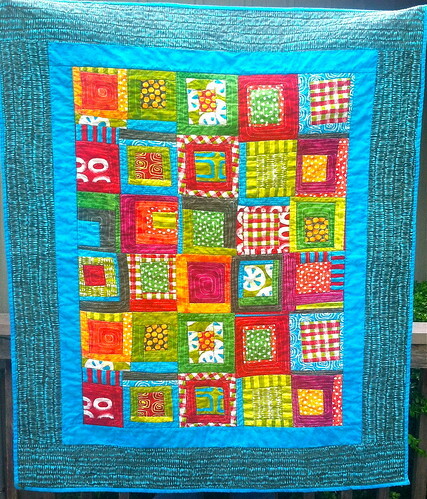 The quilt has been done for quite a while, but we always had other things to do on the weekends they came home...until now. She did a terrific job with it. 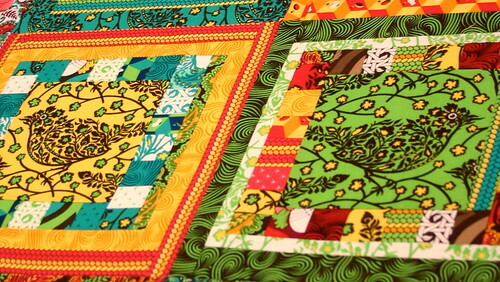 I forget what the fabrics are. 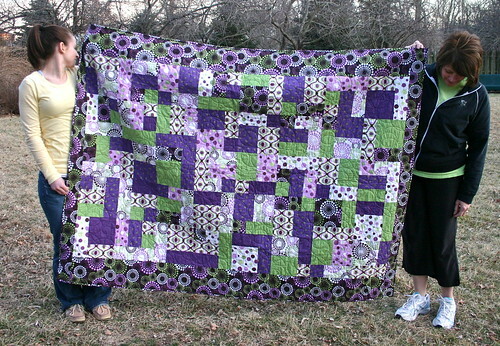 She finished the binding late on Sunday afternoon and I wanted a picture. Obviously, we weren't ready for this one. I think Baxter was running with a stick as big as he is and Jan was watching him. I have no clue as to what I was thinking! However, if any of you have been wondering where I have been, look at what I am wearing and you can guess what I have been doing with some of my spare time. It obviously hasn't been sewing...or blogging. My poor blog has been sitting patiently waiting for new posts. My sons are working on a new web site for me, so I better get back to it!! I got a peek at Christmas, and I am so excited!!! Oh, and to my sisters...I needed Johanna telling me to raise my side up a bit. Ha! These little anise flavored gems say Christmas to me. My Grandma Wenger always had them. 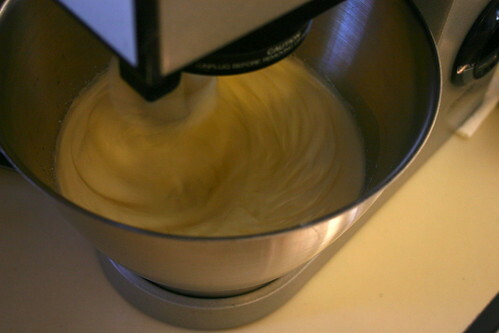 Often, when I would drop in to visit, her kitchen aid mixer would be beating away. It was loud and went for such a long time (1/2 hour). I had her teach me how to make them and I am so glad I did. 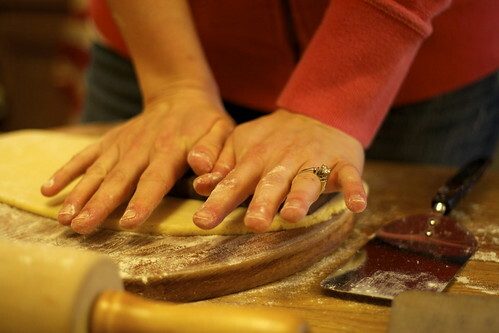 I remember her standing next to her frig on the pull-out cutting board, rolling out and pressing the dough. She made it look so easy. There haven't been many Christmases since then that I haven't made them...or attempted to make them! Well, after Christmas we had a springerle making party to show the next generation how to make them. It was fun! First, beat 4 eggs separate bowls (whites to a stiff froth and yolks creamy), then beat together with 2 c sugar. Beat it for 1/2 hour or so. Baker's amonia (hartshorn) is not at our local grocery store. I used to get it at the pharmacy, but now I get it at Hearthside (a local specialty store). Last Christmas this jar was full. They tell me it evaporates....I think they are right. Break it up and powder it, if it is clumpy (is that a word???) and add 1 t then beat it for another 10-15 minutes. 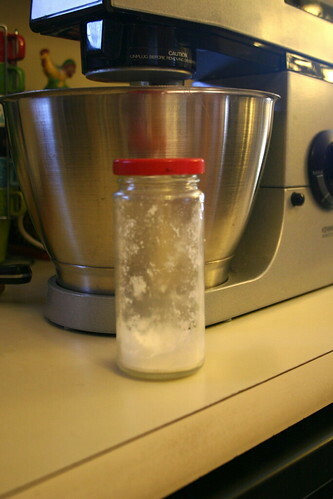 I switch out my beaters and then add the flour with this baby (instead of a spoon). I am just careful to not over-work the flour. And I always add more flour than it calls for...I use extra large eggs. No picture of the finished dough (sorry), but when it is finished, chill it. I got the dough to this point, then put it into the frig for a couple of hours. When the girls got there, we started working. 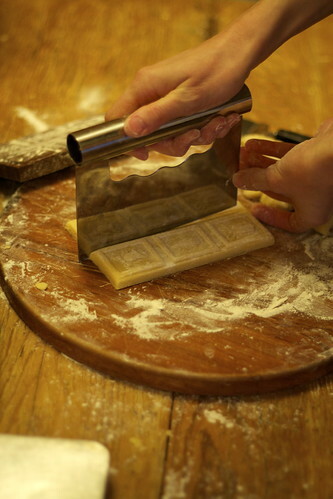 First, pull out a small ball of dough, depending upon the size of your springerle cookie press. 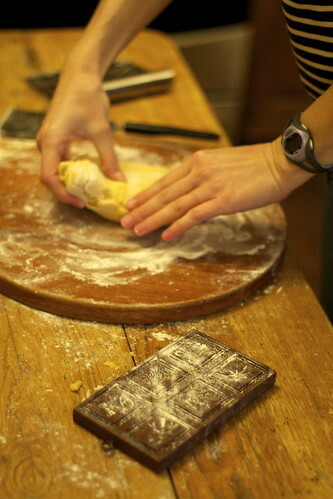 Knead in a bit of flour, as needed, so dough is not sticky. Roll the dough 1/4" (or a bit more) thick. 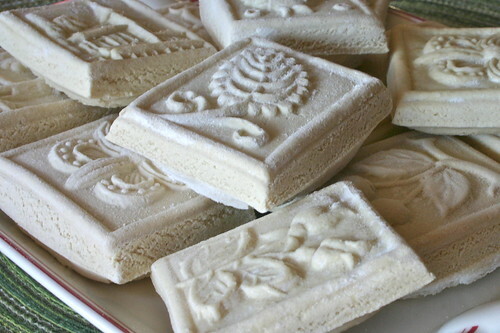 Flour the mold. 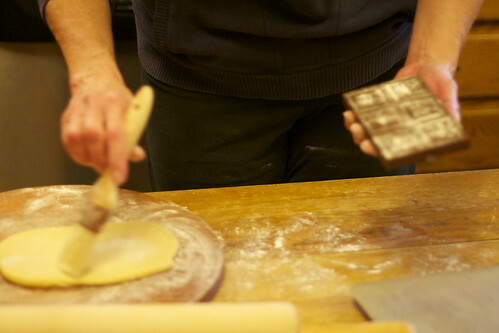 I will also lightly dust the top of the rolled out dough with flour. 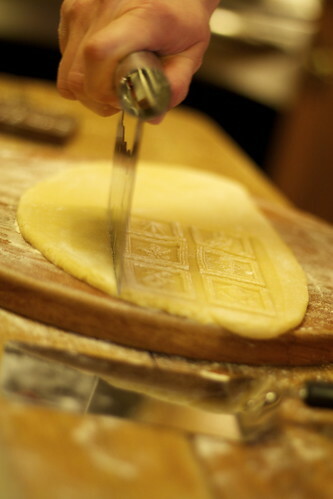 Knock the excess dough off the mold and press into the dough. 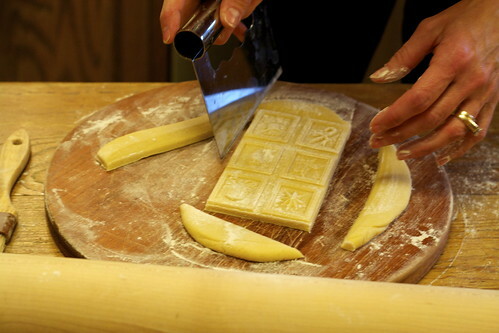 Cut the cookies apart and place them on a cookie sheet. I usually put a piece of parchment paper on the sheet first. The dough is not that yellow. It was dark by the time we made the cookies. This must have been a fun part, cause there are lots of pics of the cutting. 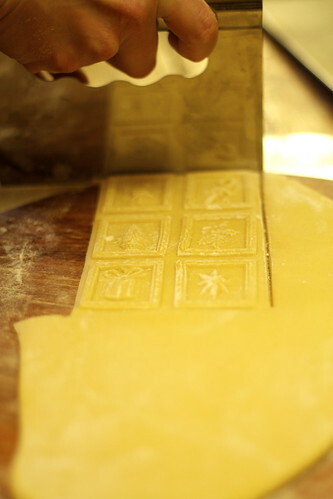 Once all the cookies are cut, put the cookie sheets in a cool room and let the tops dry for about 24 hours. If I let them dry a shorter amount of time, I have trouble with them loosing their shape. You can check them, periodically. When you pick them up, look at the bottom. 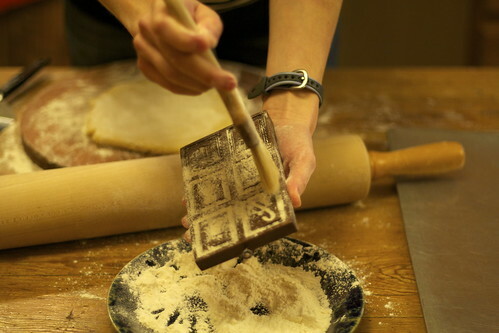 There should be a dry outer rim and a center square that is still moist (it will be a darker color). This becomes the 'foot' that raises when you bake them. And I always bake one cookie just to be sure I have the time and temp correct. You want the bottoms to be golden. These are great fresh, but even better when they have been in a tin for a couple of weeks. They don't get quite as hard as a biscotti, but close. There are some videos on youtube for making these, if you would like some extra help. I really like the one by House on the Hill. Here is the recipe as I got it from my grandma. I would love to know if any of you have made these or try my recipe. Enjoy! 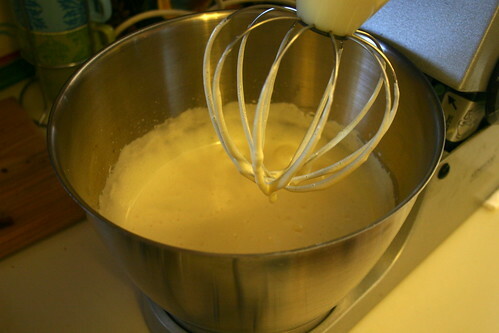 4 eggs beaten separate (egg whites to a stiff froth and yolks in a separate bowl), then beat together with 2 c sugar. 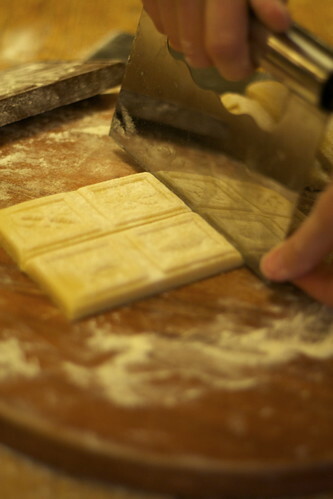 Beat ½ hour or so, then add 1 t baking ammonia which has been powdered, then beat again 10-15 minutes. Add about 10-12 drops anise oil. Add 1 lb. 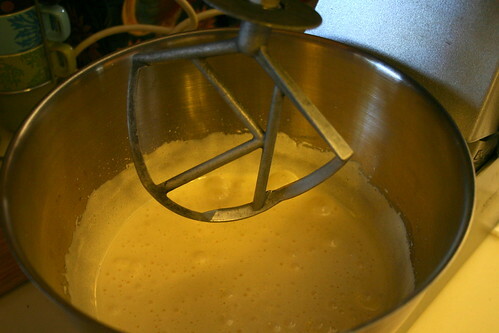 flour (stir in with spoon). Chill several hours. Roll out about ¼” thick on floured board. 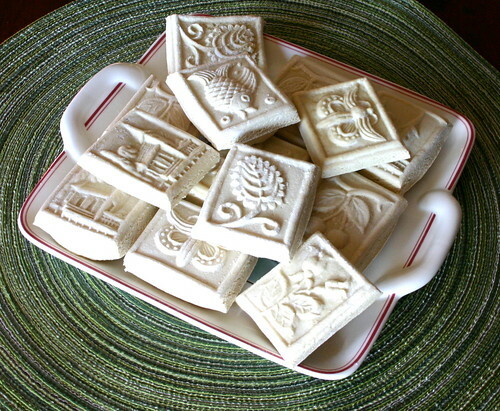 Press with springerle mold that has been dipped in flour. Cut. Put on cookie sheet and let sit overnight or up to 24 hours to dry. Bake in slow oven, 250-275 for 25-30 minutes. Bird Nests, a photo by myfullcolorlife - Vickie on Flickr. I am up for some 'finishes'! This is on the design wall right now. Looking at the photo I think I may switch a few blocks around. What do you think?